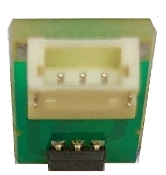 Hall (506) sensor. Wiring harness is not included. For ceramic burr grinders in Saeco and Gaggia models. The [power connection wire is a three pin connector. (See close up images). Used in Incanto Sirius, Incanto Rondo, Classic, Deluxe, BMW models Odea Talea, Primea, Italiano, Exprelia, Xelsis models and Gaggia Platinum and Accademia models. Kit includes: sensor support for coffee grinder motor. Installation must be done by skilled persons. Installation instructions are not available. Caution: The replacement of sensor is a delicate work. Careless handling can damage the plastic casing or the connection wire.